Are you playing games or sitting at your computer all day? If it hasn’t happened yet, you will gradually start to feel your body sending you signals that it’s not good for your overall health. It’s not good for your back, it’s not good for your legs, and it’s not even good for your heart. Sitting in a poor quality chair will get the best of you. So, if you simply have no other option, why not invest in a premium quality chair that will improve the overall quality of your health and actually help you live longer? Enter Herman Miller. In case you’ve never had the chance to sit on a Herman Miller body chair before, you have to give it a shot, as it is one of the most comfortable office chairs ever. It is designed to provide you with the pinnacle of comfort and the most pleasurable sitting experience, no matter what you’re doing. It can be thought of as the Rolls-Royce of gaming chairs. Basically, you don’t get anything included besides the chair itself, but you don’t really need anything else as the chair is frankly awesome. Another great thing about the chair is that it ships pre-assembled, so you can just unpack it and start using it. The Herman Miller Embody is an office chair designed to give you the most comfortable sitting experience. It is designed by people guided by empathy for those who spend 12+ hours a day sitting behind their desks and ruining their backs. Jeff Miller and Bill Stumpf have worked closely with PhDs and physicians in order to best address all the health issues associated with sitting for prolonged periods of time. This research applies to both office workers and passionate gamers. Obviously, the most important feature of the chair is the graphite spine-like composition that is designed so that it gives you the utmost support and makes it easier to focus on your high score and not your fatigue. Also, it makes the chair really stand out visually, as it looks like no other chair in the world. While we’re on the subject of visual appearance, we’re more than happy to inform you that the Embody chair comes in more than 15 different finishes and color combos. The base of the chair is a standard five-spoke one. It is considerably heavier compared to ordinary office chairs, but at the same time it provides you with additional balance and stability, especially if you like to move around your room without actually getting up. Getting back to the actual chair, there are numerous adjustments to be made, so just take your time until you really adjust the chair to your needs. The backrest can be adjusted so that it fits the curve of your spine perfectly, while you can also adjust the tilt of the seating area and the backrest separately, without losing the overall balance of the chair. Adjustments can also be made to the seat depth and the armrests. The fabric is carefully chosen so that it doesn’t cause heat buildup. 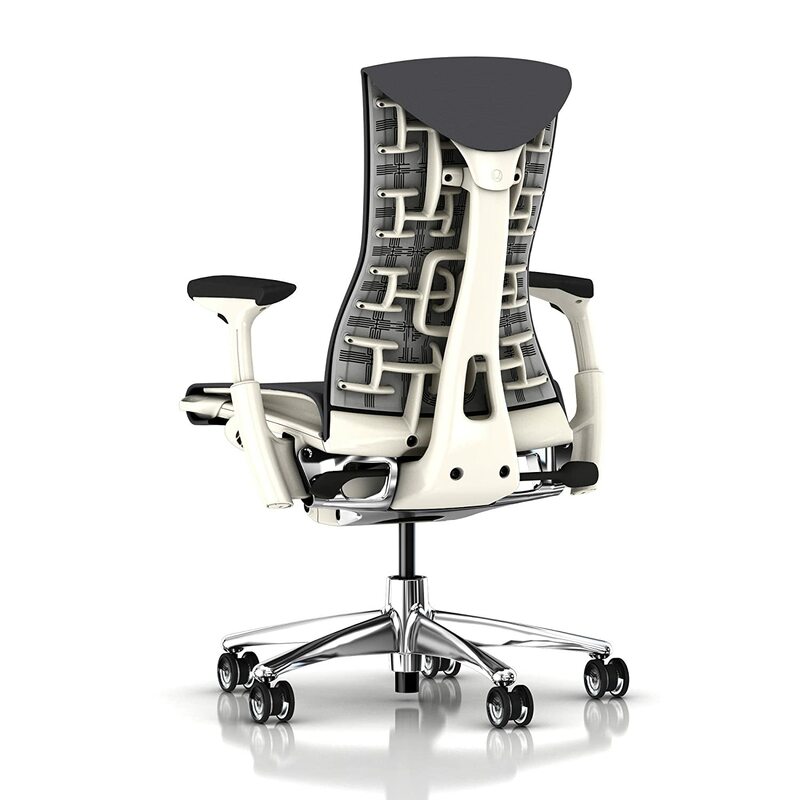 Proudly made in the US, the Embody chair comes with a 3-shift, 12-year warranty. In short, it is a package that’s really hard to beat. As you’ve seen earlier in the article, there are numerous adjustments on the chair, so it is of the utmost importance that you adjust it so that you get the most comfortable sitting experience. Using the chair without proper adjustment can result in even more back issues and will lead to you being unsatisfied with your purchase. For some people it takes weeks to find the perfect setting. The only problem is that once it’s set for you, it may not be that comfortable for someone else. If you dig this concept but find it a bit too pricey, why not opt for the previous model from the same company? The Herman Miller Aeron chair can’t quite compete with the almighty Embody, but it is also very comfortable and is a great investment to save your health and let you play video games much more comfortably. If a gaming session calls for sitting at a computer or with a joypad in your hands all day long, you definitely need to invest serious amounts of cash into a good chair. Why would you search for a gaming chair when there are office chairs which provide you with superior sitting experience and the very pinnacle of comfort? The Embody from Herman Miller is surely one of the best office chairs you will find out there for any amount of money. So if you can afford it, don’t hesitate for one second. You will keep telling yourself it’s the best purchase of your life and enjoy the gaming experience like never before.